What if McG (Charlie’s Angels, Terminator Salvation) made a Luc Besson (Léon: The Professional, Taken 2) film? 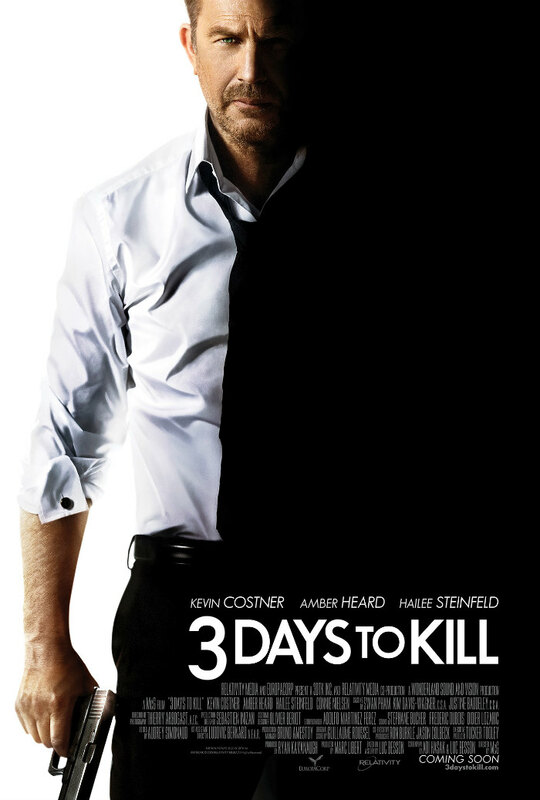 It would probably look pretty close to 3 Days to Kill, written by Besson, but directed by McG. The film has an uneven tone, which keeps it from being more than a middling diversion. CIA wetworks specialist Ethan Renner (Kevin Costner) is diagnosed with terminal cancer and given only a few months to live. After trying to get his affairs in order with his estranged wife (Connie Nielson) and daughter, Zoey (Hailee Steinfeld), he is offered one last job, to be paid in an experimental drug that may prolong his life. When his wife leaves on a business trip, Ethan is stuck trying to be a single dad while following his orders from his CIA boss, Vivi (Amber Heard). Oscillating between a bland thriller and a single dad comedy, 3 Days to Kill definitely succeeds more at the latter. There’s comedy inherit in having to kill people but also needing to be home in time for dinner. When the film focuses on the tension is Ethan’s life, it succeeds, but when the focus drifts to treating his job seriously, it stalls, largely because I never once thought that Ethan was in jeopardy, even though he is generally not particularly gifted at subterfuge or lying. He works best when sent to a place to take out or torture a specific subject, and the lack of mystery or intrigue in the film’s spy plot reinforces that the weight of the film is on the relationship between Ethan and Zoey. Luckily, the relationship moments largely work, although they rely on cliché more often than they should. Of course, Zoey is a rebellious high schooler, and Steinfeld does her best to sell it, but what actually allows the film to work is the very real emotional trappings of children who feel abandoned by a separated parent. While the film does an admirable job balancing the tones between the two stories, the inconsistency within each are troublesome. Amber Heard is an interesting choice to play a top level CIA agent, but her pleather outfits and breathy delivery feel like they come from another film entirely. Overall, 3 Days to Kill is a fine distraction, but there is nothing particularly worth recommending about it either. 3 Days to Kill opens in Philly area theaters today.